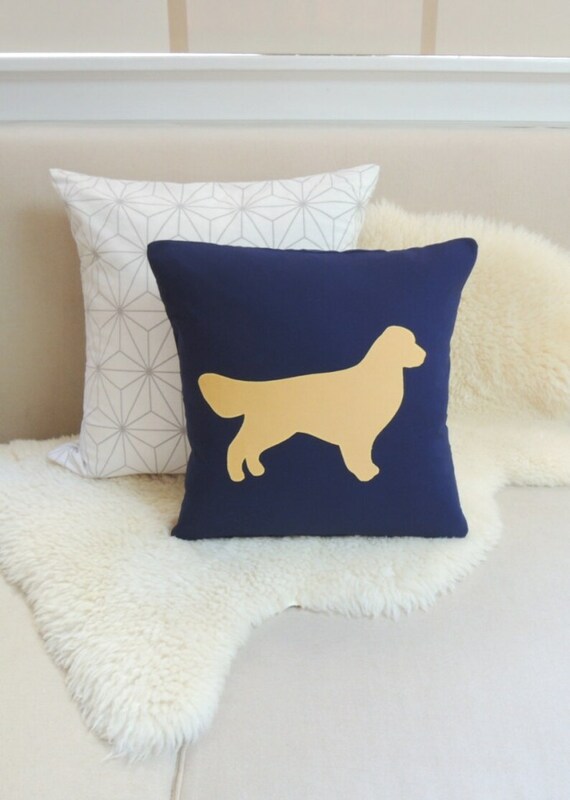 This Golden Retriever appliqué pillow cover celebrates your trusty sidekick and adds a chic accent to your interior space in classic navy blue and golden ochre. 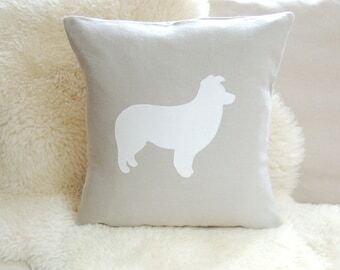 This polished pup is fetching on a sofa, in a chair, propped on a bed or greeting your guests on an entryway bench. A facing pair makes a striking statement on a sofa or sitting pretty individually in a pair of chairs. The background is available in navy blue, ivory or light pink. Choose the Golden Retriever silhouette in golden ochre, white or ivory. Makes a great gift for retriever lovers! About the collection....A modern take on traditional appliqué, each pillow cover is an original design, hand-cut and sewn with meticulous attention to detail and quality; no plastic felt, paint, die cuts or polyester screen prints manufactured by a third party here! Fabric: Soft premium broadcloth cotton for a modern look & feel. Each appliqué is machine finished with a coordinating zigzag stitch for a polished silhouette. Double-stitched seams are secured with a zigzag stitch for a durable, professional finish. Fully lined. French style envelope closure. Golden Retriever Pillow Cover © Vixen Goods. All rights reserved.